2 pack of round rice noodles cook as instructed on package. Usually, I cook them in 8 cups of cold water. Bring to boil and let boil for about 7-10 minutes. Turn off heat, close lid for 5 min. Test for doneness by pinching a noodle, if break apart it's done). Drained in colander. - While the chicken is cooking, wash the green onions and cilantro. 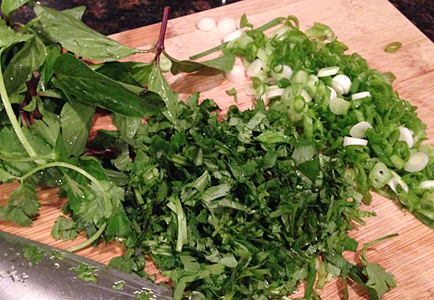 Thinly sliced the green onions and roughly chopped up the cilantro. - Remove the chicken from the pot, the water from the chicken should run clear. Set aside to cool. - Remove the meat from the chicken (if using whole chicken, leave the wings and thighs) and put the bones back into the pot (to sweeten the broth). Simmer on medium for at least 20 min. When ready to eat, REMOVE the bones and onions from the stock, ADD the sautéed shallot to broth and bring the broth to boil. 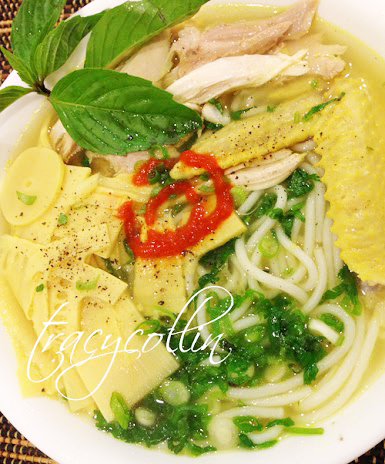 - Put noodles into a bowl, put the chicken meat on top, scoop in the broth and bamboo shoots. The noodles should submerge in the broth. Sprinkle with green onions and cilantro. Top with a dash of pepper and Sriracha hot chilli sauce or slices of chili. * If I have guests over, I usually put a small dish of fish sauce with a few slices of chilli on the table for those who wants a saltier broth.